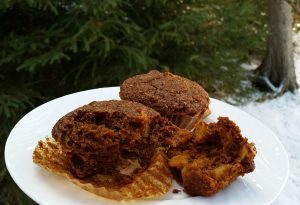 When classic bran meets gingerbread, sweet pears and tart-sweet apples you won’t even believe the muffins they make! Fragrant with spices and molasses and oh, so tender and moist they’re the perfect thing to bake on a snowy afternoon. Preheat oven to 375°F. Line a 12-cup muffin pan with paper or silicone liners. In a medium bowl, whisk together bran, milk and yogurt. Let stand for 5 minutes. Add egg, brown sugar, oil, molasses and vanilla to bran mixture and whisk to combine. Pour over dry ingredients and sprinkle with pear and apple; stir just until moistened. Divide equally among prepared muffin cups. in pan on a rack for 5 minutes, then transfer to rack. Tips: You don’t need to peel the pear and apple, but you can if you prefer. For pears, I like Bartlett or Bosc because they hold their shape and flavour when baked, for apples, any tart-sweet apple is good for muffins: Spartan, Empire, Crispin (Mutsu) and Ida Red and even McIntosh. These are on the sweeter side of muffins (but not quite cake-sweet), but you can cut back on the sugar to 1/3 cup if you prefer a less sweet version, or use cooking molasses instead of fancy.